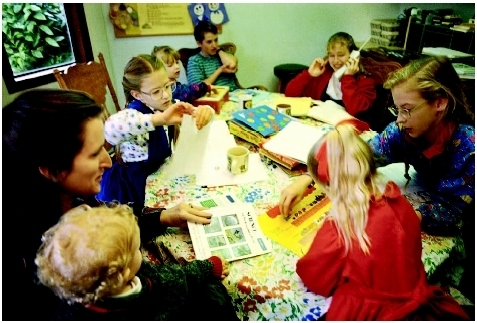 Home schooling is the process of educating school-aged children at home rather than at a school. As of the early 2000s, it is perhaps one of the fastest growing trends in education in the United States. Since 1993, the practice has been legal in all 50 states. About 1.1 million students were being home-schooled in the spring of 2003, according to the National Household Education Surveys Program (NHES), which was conducted by the United States Department of Education. In addition, the percentage of the school-age population that was being home-schooled increased from 1.7 percent in 1999 to 2.2 percent in 2003. Parents choose to home-school their children for a variety of reasons, though certain factors appear to be more prevalent than others. Nearly two-thirds of the parents of home-schooled students reported that their primary reason for home schooling was either concern regarding the environment of schools or a wish to provide moral or religious instruction. Societies have practiced home schooling for centuries. In North America, home schooling was widespread until the 1870s, when compulsory school attendance laws and the development of professional educators came together to institutionalize education in the form recognized in the early 2000s as the school. Some preeminent historical figures who were home-schooled include several presidents, such as George Washington, John Quincy Adams, Abraham Lincoln, and Franklin Delano Roosevelt. Other home-schooling successes in American history include Thomas Edison, General Robert E. Lee, Booker T. Washington, and Mark Twain. Although home schooling was practiced in a limited way after the 1870s, it was not until the 1960s that this practice claimed attention from a large number of parents and educators. The writings of Raymond Moore, a former U.S. Department of Education official, and John Holt, author of several books on education, gave credence and national presence to a growing home school movement. Moore began researching the institutionalization of children's education and concluded that a child's first foray into formal education should not begin until sometime between eight and 12 years of age. Holt advocated the decentralization of schools and a greater degree of parental involvement. He believed that the most civilized way to educate a child was through home schooling. Prior to 1993, when home schooling became legal in all states, many parents who taught their children at home often faced arrest and jail time, amidst accusations of neglect and abuse. Most of that changed over the following decade. Even so, attitudes about home schooling vary widely from state to state, and there is a patchwork of regulation across the country. Some states may require a state-approved curriculum, conduct home visits periodically, and require that home-schooling parents be certified teachers. Others may not require a parent to have any contact with the state and have no minimum educational standards for the home-schooling parent. A mother home schools her children. abuse, neglect, and other problems. The NEA is also concerned that home schooling will eventually lead to a diversion of funding from the public schools. In the 1960s and 1970s, most home-schooling parents were members of the counter-cultural left. By the 1980s, however, most home-schooling parents were part of what is often called the Christian Right. In the early 2000s, approximately 75 percent of American home schoolers are practicing Christians. However, not all home-schooling parents are Christians. The rise in home schooling is reaching a much broader range of families. For example, the fastest growing number of practicing home schoolers is among Muslim Americans. Some surveys show that the average home-schooling family has an above average income. Others indicate that the household income of home schoolers is very similar to that of non-home-schooling families. Most home-schooling families have above-average levels of education. One important factor is that home-schooling families are 97-percent two-parent families, and most home-schooling mothers do not work outside the home. The average size of a home-schooling family is three children or more. Home schooling involves a tremendous commitment from the parents. At least one parent must be willing to work closely with the child, develop lesson plans, keep current with government requirements, and sometimes negotiate issues with the local school district. The most common home-schooling arrangement is for the mother to teach while the father works outside the home. There are numerous educational materials available that are geared for home-schooled children. These include correspondence courses, full curricula, and single topic books in areas such as math or phonics. There are both religious and non-religious publishers of these materials. Some parents do not use these materials and develop individualized lessons based on their children's unique learning needs. One of the questions many people have is how home-schooled children perform academically. According to the U.S. Department of Education, virtually all of the data available illustrate that home-schooled students perform at an above average level on a variety of tests, including the Scholastic Aptitude Test (SAT). Interestingly, one study found that students whose parents are certified teachers performed no better than other students and that neither parental income nor parents' educational background had a significant impact on student performance. In the late 1990s and early 2000s, home-schooled students have gained admission and scholarships to such prestigious universities as Harvard, Yale, Stanford, and MIT. In 2000, Patrick Henry College opened, a university established especially for home-schooled children. One disadvantage to home schooling is the loss of an income in a family, since many families make the decision to live on a single income so that one parent can devote time to educating the children. Some home-schooling families find the practice of home-schooling confining. It takes a great deal of dedication and preparation for instruction and schoolwork. One of the most often voiced concerns is that children who are home schooled are not properly socialized. However, there are numerous opportunities for home-schooled students to interact with others, including libraries, scouting, 4-H, sports teams, and a variety of church activities. In addition, many local communities have formed home-schooling associations in which children have many outlets for interacting with their peers. Parents interested in teaching their children at home should thoroughly research what is involved before making the decision to do so. They need to be informed regarding the laws in their state and local school district, which may affect their decision. Holt, John, Patrick Farenga, and Pat Farenga. Teach Your Own. Boulder, CO: Perseus Publishing, 2003. Pride, Mary. Mary Pride's Complete Guide to Getting Started in Homeschooling. Princeton, NJ: Harvest House Publishers, 2004. Klicka, Christopher J. "The Facts Are In: Homeschoolers Excel." Practical Homeschooling (January/February 2004): 12–14. Postlewaite, Charlotte C. "The Home School Debate: States are Responding to the Increasing Number of Parents Who are Home Schooling Their Children." State Government News (February 2004): 18–20. Home School Legal Defense Association. PO Box 3000, Purcellville, VA 20134–9000. Web site: http://www.hslda.org. National Home Education Research Institute. PO Box 13939, Salem, OR 97309. Web site: http://www.nheri.org. "1.1 Million Homeschooled Students in the United States in 2003." National Center for Education Statistics , July 2004. http://nces.ed.gov/pubs2004/2004115.pdf (accessed December 11, 2004).